Hawaii, with it's usually ideal climate, now has the worst homeless problem in the country. What do you suppose causes that? With the highest cost of living in the nation, it is small wonder that if someone falls on hard times that they wind up on the street. It's also a magnet, climate wise, for those who know they will be on the streets. The Hawaiian government is notoriously controlled by Democrats. Their progressive policies have created this mess. But, never fear, they've come up with a solution! Yep, they are going to take real estate that no one else wants and put what they call 'transitional housing' on it. This 'housing' is made up of shipping containers, divided in half to form a duplex of sorts. If that's what you can call it. Each one has 73 square feet... big enough for bunk beds and for two adults to sit in them. That's it. They have one window and a screen door with an awning. There is reflective paint on top of them and no air conditioning. Bathrooms and showers are communal in a trailer nearby. HONOLULU (AP) — Hawaii Gov. David Ige has declared a state of emergency to deal with the state's homelessness crisis just days after city and state officials cleared one of the nation's largest homeless encampments. 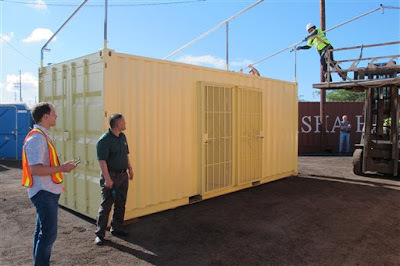 Meanwhile on Friday, crews were installing converted shipping containers for Honolulu's latest homeless shelter on a gravel lot on Sand Island. The rooms in the first units were designed for couples and are 73 square feet. "If they're living in tents now, the individual units are going to be just as large or larger," said Chris Sadayasu, asset management administrator for the Honolulu Office of Strategic Development. The rooms, which were made from new shipping containers, each have a window and a screen door for ventilation. The structures are insulated, and the roofs have white reflective coating, and an awning will provide shade for relaxing outside, said Russ Wozniak, an architect and engineer from Group 70, an architecture firm. The coating and insulation keep the units about 30 degrees cooler than they would otherwise be, Wozniak said. "It's kind of as comfortable as you can get without mechanical air conditioning," Wozniak said. A trailer on-site holds five bathrooms that each have a toilet and shower, and there's a separate portable toilet and shower that are accessible to the disabled. 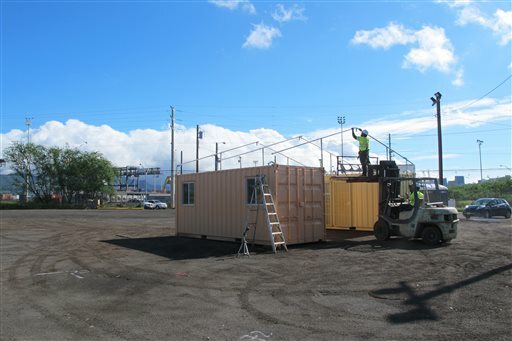 When completed in December, the shelter in an industrial part of Honolulu will temporarily house up to 87 clients at a time. To give you context, a jail cell is 12x7, which is 84 square feet. That includes a toilet and a sink. These do not. Prison cells are bigger, better equipped and more pleasant than these containers. These are what I call sweat boxes. This is humane? I suppose it is better than living in tents and the mud, but I'm not sure about that. There is no requirement to get sober or seek mental health assistance first, so do the math here. It will be unpleasant, crowded and dangerous. How about putting these people to work? The Mormons put them in apartments and give them jobs so they can get back on their feet. But not Hawaii. No, you see... this is the Agenda 21 model they have in mind for all of us. Living in tiny homes, preferably shipping containers, and just living to work and exist. I find this abhorrent. I don't see this as a kindness or a real solution for the homeless. Typical Democrat solution. It will create more problems than it solves.